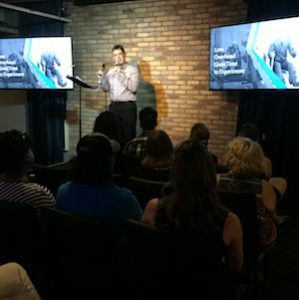 Augsburg College held a “mini-Ted Talk” style event July 7 at Sisyphus Brewing in Minneapolis, which they called “7 People, 7 Passions, 7 Minutes.” The event featured insightful talks from seven of its passionate alumni. Lab 651 cofounder Justin Grammens was privileged to be one of them. His talk was about how new product innovation inevitably gets started — he titled it, “The Next Billion-Dollar Business Is In Your Neighbor’s Garage.” He pointed out that, as large companies try to innovate, what generally happens is that small companies are the ones that can take the risk, look to the future, and see what’s coming around the bend. After being in technology and seeing transitions for more than 20 years, Justin shared his perspective on how open hardware, open software, and a “perfect storm” of technology is coming together to enable the next revolution in computing. Justin summed up as follows: “I was blessed to have this opportunity to share my view of change in traditional R&D. It’s a vision in which I see Lab 651 as a new model to enable both new and old companies alike to think about what’s possible today.” Justin Grammens holds a bachelor’s degree in math and physics from Augsburg College, and a master’s degree in software systems from the University of Saint Thomas.